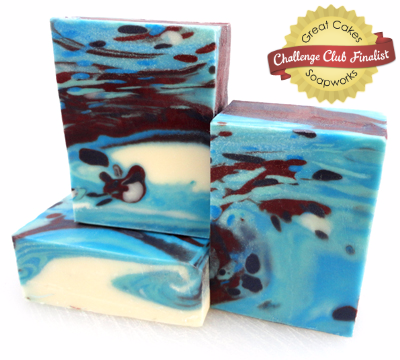 Hard to believe this was the next to last soap challenge! 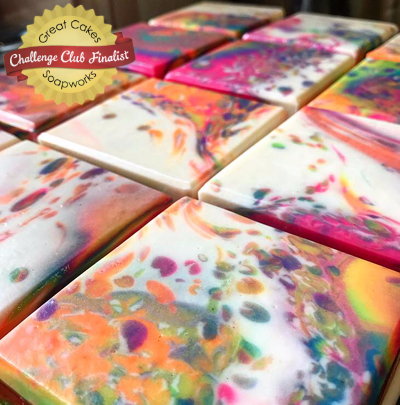 November’s technique was specifically created for the Soap Challenge Club by guest teacher Joanne Watkins of Nature’s Potion Handmade Soaps. As both a soapmaker and acrylic paint artist, Joanne found a way to safely re-create the dirty fluid pour technique for acrylic paint with soap. As you will see, there are some stunning results from this technique! 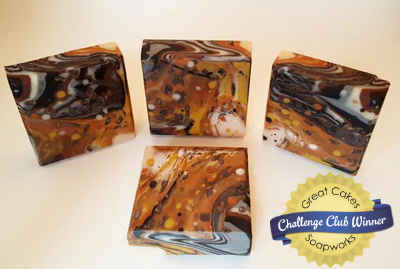 The challenge was divided into a juried category, sponsored by Elements Bath & Body and a voted category, sponsored by Custom Soap Stamps. The winners of the juried category were chosen by four jury members including Tatiana Serko of Creative Soap by Steso, Jelena Vasiljeva of SoapTechniques, Kenna Cote of Modern Soapmaking, and myself. The winners of the voted category were determined by the votes of those who registered for the Challenge Club this month. Elena’s prize is a $100 gift certificate from Elements Bath & Body, Your One Stop Shop for Wholesale Soap Making Supplies! Congratulations! 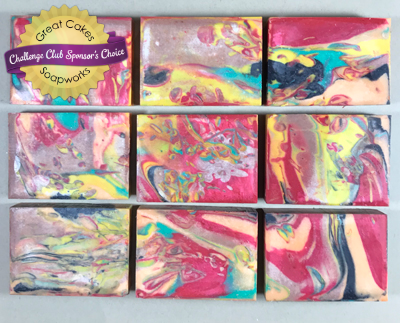 Please click on Elena’s soap photo to read more about her inspiration and how she created her soap on her blog. Lisa wins a $75 gift certificate from Elements! After three and half years of participating in the challenges, her list of prizes is quite extensive! Congratulations once again, Lisa! Click on the photo to read more about her soap in her Facebook album. Congratulations to Jamie for winning a $50 gift certificate from Elements!! Check out her soap in the mold as well by clicking on the photo to see her post in Instagram. Karen receives a $25 gift certificate from Elements. She has been a long-time member of the Challenge Club and this is the first time she has received a prize! I’m so happy for her! 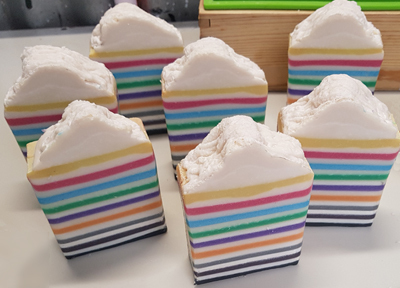 Click on her photo to read more about how she created her soap in her blog post. 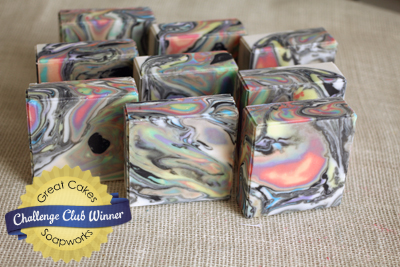 Sara wins a $75 gift certificate from Custom Soap Stamps! 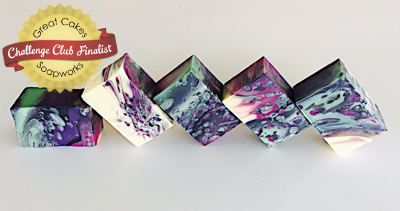 Feel free to click on the photo of her soap to read more about her process on her blog. 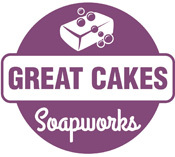 Leilani’s prize is a $50 gift certificate from Custom Soap Stamps! 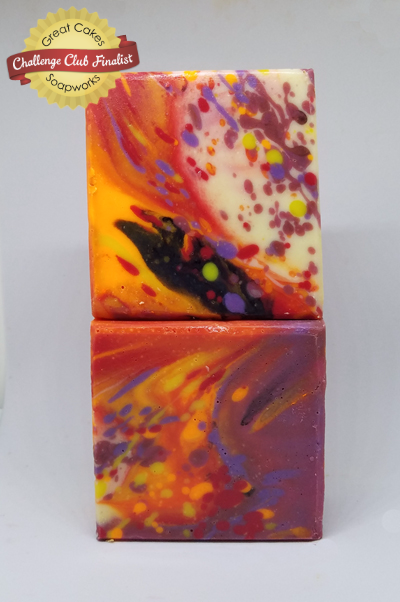 You will want to check out her Facebook post by clicking on the photo of her soap! Ritza wins a $25 gift certificate – woo hoo! If you’d like to see the rest of the entries from this month’s challenge, check out the voted category entries HERE, and the juried category entries HERE (which includes the list of the top 10 winners!). 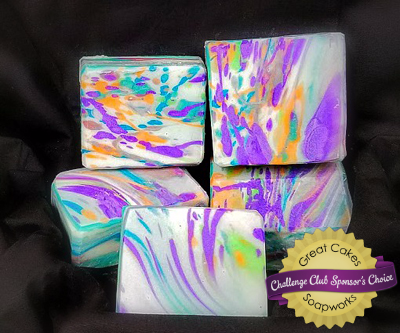 You will also receive the following prizes just for entering a soap in the challenge: $10 off shipping coupon from Bramble Berry, plus a 10% discount code and a special mystery prize from Majestic Mountain Sage.